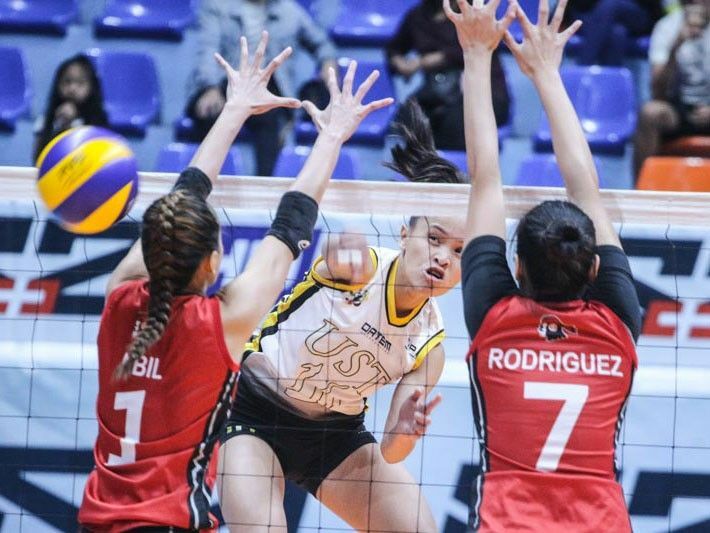 SAN JUAN, Philippines — The UST Golden Tigresses continued their winning ways after dumping the hapless UE Lady Warriors in straight sets, 25-17, 25-14, 25-20, in the 81st UAAP women's volleyball tournament at the FilOil Flying V Centre on Sunday. The España-based squad ends the first round with a 5-2 slate, good enough for the second spot. Defending champions DLSU also sport a similar record. Since losing Milena Alessandrini to injury in their game against FEU, UST has been rolling. The Tigresses head into the second half of the season on a three-game winning streak, including a straight-set upset win over the Lady Spikers. The Tigresses were dominant for most of the game, with the UE Lady Warriors barely putting up a stand. It was all UST to start the match, with an early 9-2 lead over the Lady Warriors. But the Lady Warriors had a run of their own, taking advantage of errors from the UST side while generating offense with Judith Abil leading the way. UE inched closer to the Tigresses, 10-13. The comeback falls short, however, as UST once again gained the upper hand. Despite a better fight from the Lady Warriors, the deficit proved too much. Come the second set, UE looked out of it. The Tigresses exploited the Lady Warriors' defense. Sisi Rondina, Eya Laure and Dimdim Pacres all connived to deal UE a beating and take the 2-0 lead, 25-14. Determined to close out dominantly, the Tigresses continued their dominance in the third set. UST held a comfortable lead, 19-13. Despite efforts from the Lady Warriors to cut into the lead and get back into the game, it was too late as UST held on for the sweep, 25-20. Rondina and Laure combined for 32 points to lead UST to victory, while Abil was the lone bright spot for UE with 15 points. UE drops to a 1-6 record at the end of the first round.